Preterm babies at risk of a serious eye abnormality that can cause blindness are benefitting from a unique program between three Melbourne health services. 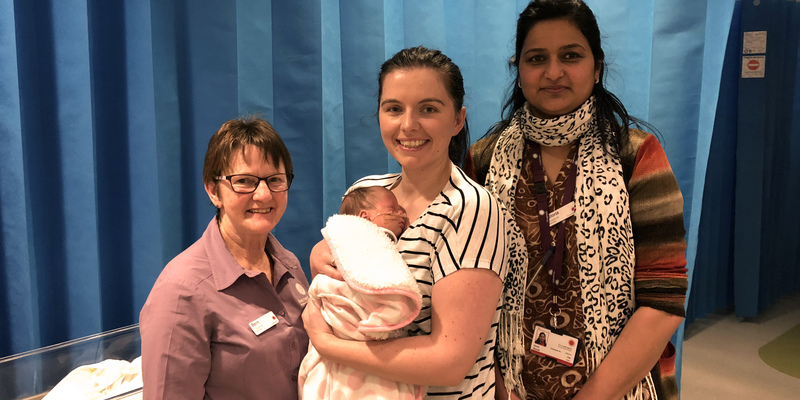 The ‘Eyes on the Road’ program began as a partnership between the Royal Women’s Hospital and Northern Hospital Epping, and allows two specially trained neonatal nurses from the Women’s to travel north with equipment to scan babies at risk of Retinopathy of Prematurity (ROP). Prior to this program, preterm babies would either have to stay at one of the state’s four tertiary hospital newborn intensive care units (NICU) to receive their testing or require a day of specialist transportation with the state-wide Paediatric Infant Perinatal Emergency Retrieval (PIPER) service for the three-minute examination. ROP is a developmental abnormality that causes abnormal growth of blood vessels in the eye and can lead to a partial or fully detached retina or blindness. Babies born before 30 weeks or weighing under 1250 grams at birth might require eye screening. Babies born between 23-26 weeks’ gestation are more likely to develop the condition, and early detection via screening allows for treatment to be given, if necessary. The Women’s is the only hospital in Victoria to have trained neonatal nurses in this screening – performed using digital retinal photography to examine the eye’s blood vessels – which is otherwise conducted by a paediatric ophthalmologist. “Due to the limited number of ophthalmologists able to undertake ROP screening, many babies remain in or move to a NICU rather than receive care in a local hospital with a Special Care Nursery closer to their families,” the Women’s Medical Director of Neonatal Services, Associate Professor Carl Kuschel said. “This has the flow-on effect of restricting access to beds for other babies, increasing health costs, and causing distress for parents who need to travel longer distances away from family supports to the major hospitals where their baby is being cared. “This program has enabled us to improve the quality of care for these vulnerable babies closer to home, with less disruption and less strain on their families. Northern Health General Manager of Women’s and Children’s Services, Debra Bourne sees the program make a real difference to young vulnerable patients and their families. “By removing the need for babies to be transferred to perform a short but important test, this partnership is improving the experience and wellbeing of our vulnerable babies and their parents. This allows them to be cared for closer to home in our Neonatal Unit,” Ms Bourne said. The partnership has proved so successful, the Women’s has expanded the program to Eastern Health’s Box Hill and Angliss hospitals and the Women’s at Sandringham. The Women's neonatal nurses Bernadette Golding, Christine Lim and Gloria Manuel now visit all four hospitals on an as-needs basis once a fortnight and have trained nursing staff at each hospital to assist with the screening. The Women’s is currently in the process of evaluating whether the program can extend even further to other health services across the state.